Which classic children’s books are dying out? March 01, 2018, 1:00 p.m.
Today is World Book Day and kids across the nation are celebrating the stories and characters in children’s literature that they most love. New YouGov Omnibus data reveals that the nation&apos;s kids still appreciate the joy of reading a good book just as much as older Brits. Three quarters (76%) of children say that they enjoy reading books a lot or quite a lot, an almost identical proportion to that among adults (78%). The data shows there is a big gender divide, however. Over eight in ten girls (82%) and women (89%) say they like to read books quite a lot or a lot compared to around seven in ten (71%) boys and two thirds (67%) of men. Children’s literature is highly prized in the UK, with many of the classics of the genre written by British authors. However, the research shows that the young people are increasingly likely to overlook some of Britain’s most cherished children’s books. 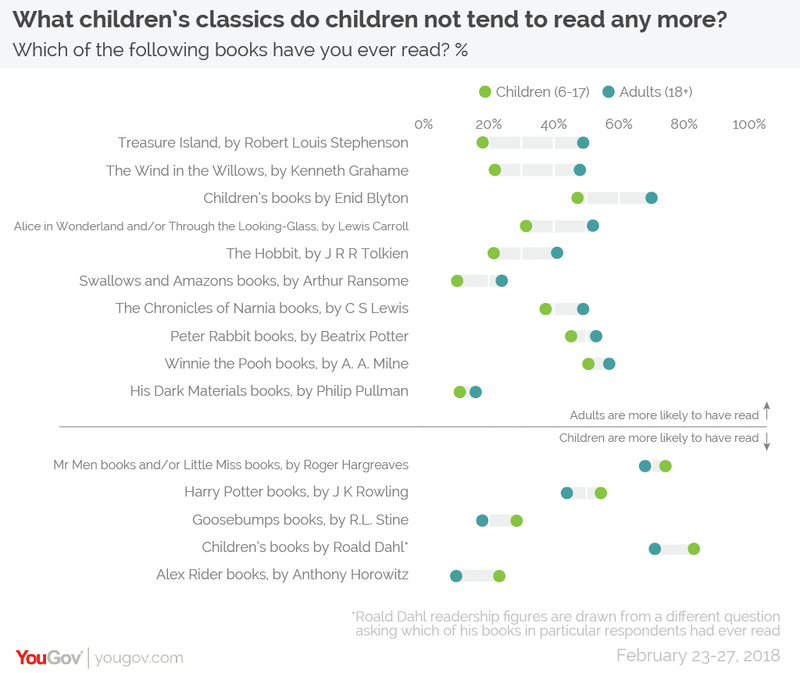 YouGov ran two surveys - one of children aged 6-17 and one of adults - asking which of a selection of classic and contemporary children’s books they had ever read. The results reveal which stories are still being regularly enjoyed by children today and which are catching dust in the local library. Robert Louis Stephenson’s timeless classic Treasure Island sees the steepest decline in readership by age of all the books listed. Overall, half of adults (49%) have read the book – including 80% of those over 65 and 73% of 55-64 year-olds – but only 19% of children have done so. Other old classics have seen similar declines. Kenneth Graeme’s classic the Wind in the Willows has been read by 48% of adults but only 23% of children. A similar trend is seen when it comes to Lewis Caroll’s Alice in Wonderland and/or its sequel Through the Looking Glass where only a third (32%) of children have read either book compared to the majority (52%) of adults. Half of children (48%) say they have read a children’s book by Enid Blyton (whose series include the Famous Five, the Secret Seven, the Adventure series and Noddy), but this is notably lower than the 70% of adults who have done the same (including 81-82% of those over the age of 50). It is not all doom and gloom, however, with children today being more likely than adults to have indulged in the worlds crafted by Roald Dahl and JK Rowling. 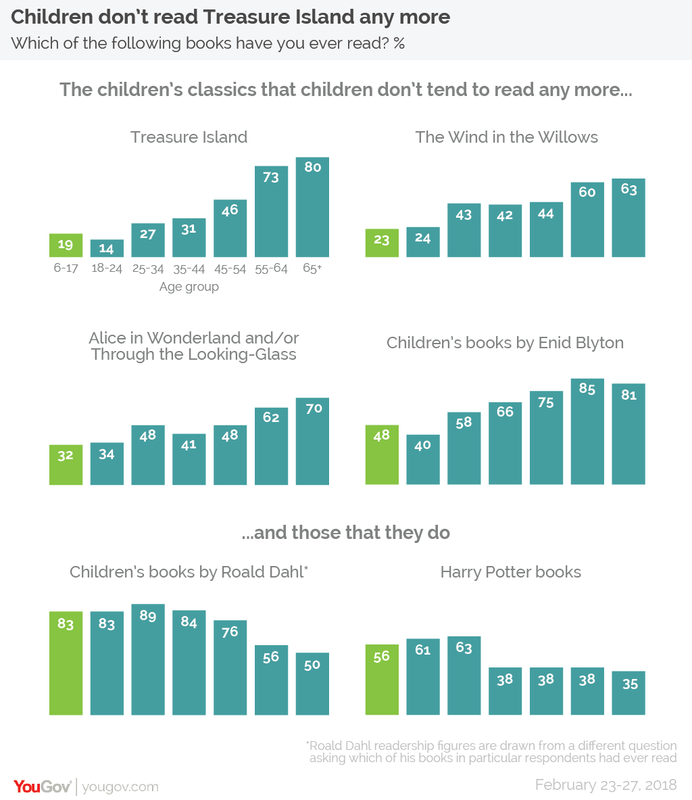 More than eight in ten children (83%) have read at least one* of Dahl’s books, compared to 71% of all adults and 56% have read any of the Harry Potter books (versus 44% of adults). Roger Hargreaves’ Mr Men and Little Miss books remain well-read among children and adults, which three quarters (74%) of kids having read one, as well as 68% of grown ups. Winnie the Pooh books by AA Milne have seen a similar degree of consistent readership – 51% of children report ever having read about the adventures of Pooh Bear and his friends, as have 57% of adults. (Although it could be the case that many younger Brits have read more recent adaptations of Winnie the Pooh, rather than those specifically by AA Miline).